I Was Born To Cook: More cupcakes, anyone? It seems as if I've been on a cupcake kick lately (I have more to blog, even after this post! )...I don't care what anyone says about the "trend" being over - they're always a big hit. And so convenient to bring to a party, kids or no kids. People.love.cupcakes. I was looking for a refreshing flavor to bring to my cousin's BBQ. Something I hadn't tried before. Immediately, I thought of key lime...the pie I've been making forever is always well received...so off I went to do some research. Oh my. I really wish I made more of these. Preheat oven to 350 degrees. In a mixer with a whip attachment, cream the butter until light and fluffy. Add the sugar and continue to cream. Gradually add the vanilla and eggs and mix in well. Sift together dry ingredients; then mix into the butter mixture alternating with the milk. Pour batter into cupcake paper-lined muffin tins filling them 3/4 full. Bake until puffed and firm in the center and light golden brown on top, about 20 to 25 minutes. Let cool. In a large bowl, beat pudding and heavy cream with a wire whisk for 2 minutes. Let stand 3 minutes. Beat in lime juice and food coloring, then stir in powdered sugar. Cover and refrigerate. For the frosting: I used the leftovers from this recipe and added more cream cheese and confectioners' sugar to stretch it. You can use the standard recipe, or white buttercream...either would work just fine. 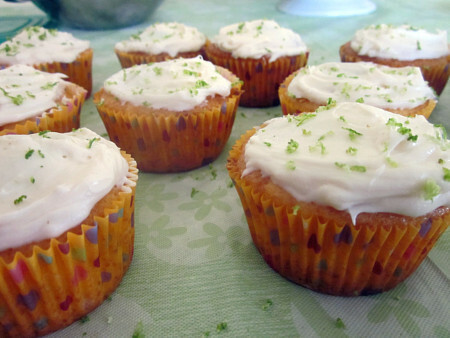 Remove cupcakes from pans and let cool completely. Using whatever device you'd normally use to form a well in the middle of your cupcake (I used a baby spoon! ), dig a hole then add filling. 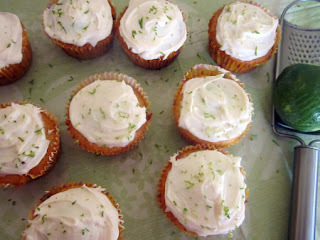 Add frosting and top with lime zest. I love lime! These look perfect for summer! What a great idea! 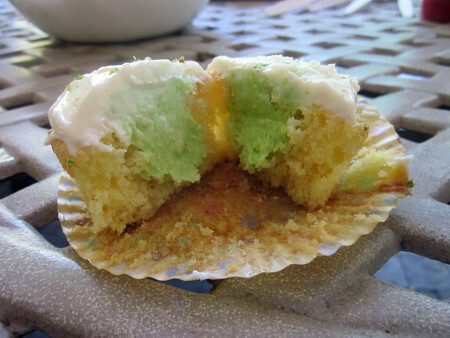 I love the filling and the frosting looks so delicious with those little lime flecks in it. I think you're right - people do love cupcakes, whether we know they are "in" or not. Cannot wait to try these for the next BBQ we have/go to! these look amazing! make them again soon and bring them overrrrrrrrr! I love these. I've made several key lime desserts lately and they're always so cool and refreshing. Love the filling! I'd like to invite you to share your recipe on A Well-Seasoned Life's Sweet Indulgences Sunday. These sound so tasty and look so colorful! Please share with our readers by linking up at Muffin (and Cupcake) Monday. Thanks! Oh how I adore filled-cupcakes. Great recipe for summer. I made these for a bbq and they were devoured and complimented over and over. I felt guilty that it wasn't my recipe lol. But I did say it was a recipe from a great baker so credit is given where credit is due! Big hit!